KELMAPLAST cable protection tapes protect underground cables and pipes from mechanical damage perfectly, simply and permanently. These ecofriendly polyethylene products are the alternative to protective covers and cover plates and come with a long list of advantages. Simply unreeled in the trench, they save time and money and keep the filling material separate from the sand bed, thus preventing stones and gravel from working their way in and also displacement from occurring during compaction. 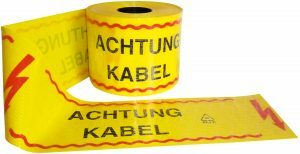 Irrespective of the material thickness, every cable protection tape can be walked on while it is being laid and dug up again, and the smooth surface also makes guiding the excavator bucket easier. 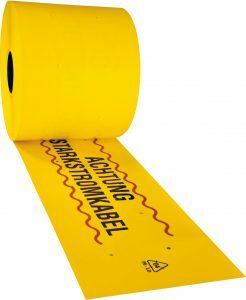 KELMAPLAST cable protection tapes are also resistant to all influences in the ground and their permanently legible print permit clear identification of both the type of utility line and its owner. Perforations allow humidity to pass through, thus preventing any undesirable build-up of heat. 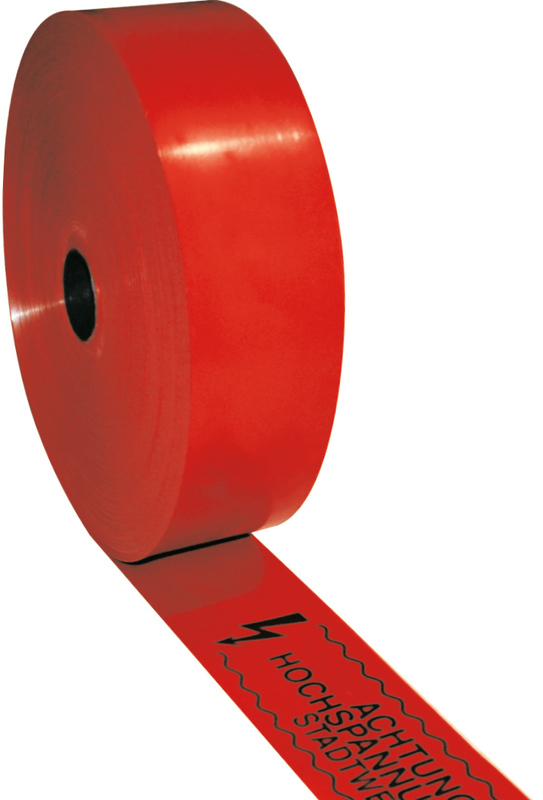 The tape is available in thicknesses of 0.25 mm to 4 mm with a tolerance of ±5 %. The reel lengths of between 20 m and 100 m are adjusted to a maximum weight of 30 kg with a tolerance of ± 0,5 m in accordance with regulations. This particular tape is suitable for the most common areas of application and, coming in thicknesses of between 1.5 mm and 4 mm, it also passes the mandatory dart drop impact test, which simulates the damage potentially caused by spades, pickaxes and sharp-edged filling material. Other dimensions and colours on request. Standard colours: yellow and red; the standard print colour is black. 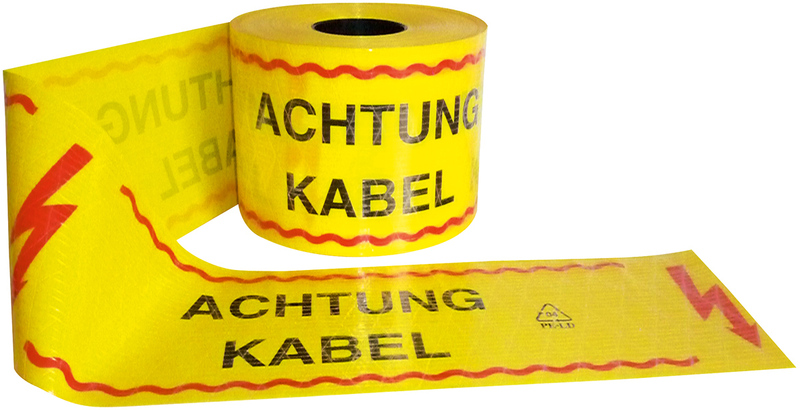 KELMAPLAST cable protection tape no 09 comes in thicknesses of 0.5 to 10 mm and was developed to complement no 08. It is perforated to allow the passage of humidity, thus preventing unwanted build-up of heat. 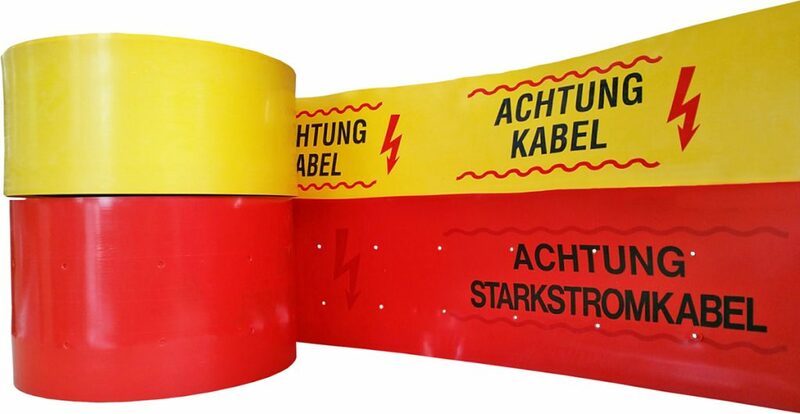 The “muscleman” among KELMAPLAST cable protection tapes – with fabric reinforcement for tear resistance. Despite being relatively thin – at a thickness of between .025 and 0.35 mm – this option has virtually the same technical and chemical properties as cable protection tape no 09. Thanks to its extreme flexibility, it is also more than easy to lay.